The announcement of GTA Online was a relief for those of us who still insisted on holding a candle for All Points Bulletin, the MMO gang-shooter that wasn’t functional enough to keep its developers running for a month after its release. GTA Online meant we could pin our hopes a game that seemed capable of fulfilling its promise of open-world naughtiness, and not APB. Not such a relief for GamersFirst, the company who bought APB after Realtime Worlds’ demise and set about re-kitting it as a free-to-play Steam offering. They had a rough month in September – though as it turns out, not as rough as you might think. The entire games industry sank beneath the tread of GTA V’s boot that month – GamersFirst reckon online PC games recorded in Steam’s ‘western-market area’ stats took a 30% hit in average peak CCU levels upon its release. “Given GTA V broke the record for top grossing 24 hour sales in the history of ALL entertainment, one would expect the wind to get knocked out of the rest of the game industry for some period of time, especially for action-oriented games like Saints Row, All Points Bulletin and Planetside,” said GamersFirst is a refreshingly honest assessment of their situation. But once things returned to something like normal last week, it transpired that APB Reloaded wasn’t any worse off than the average online PC game recorded in Steam’s stats. “Not to say we didn’t take a dent,” said GamersFirst. “But we are still here. Still plugging away. And still working on our ambitious long term plans. Now GamersFirst can set about implementing the huge engine update they’ve been working on in secret since July. 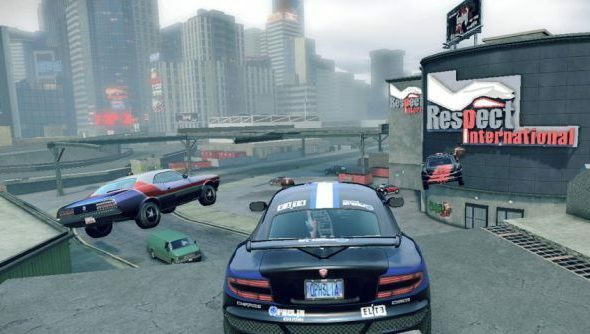 APB has been running on the same version of Unreal 3 seen in Unreal Tournament 3, and its team have repeatedly run up against performance ceilings as a result. What’s more, a heavy reliance on custom systems for the ageing engine means development has been slowed overall. As such, GamersFirst have made the “drastic” decision to upgrade the game to the Gears of War 3 version of Unreal – a shift that will offer the possibility of improved lighting, graphics card optimisations and better minimum spec performance, not to mention faster development of new features. They’re a stoic bunch – and they’re not done talking about GTA V yet. Oo-err. Are you likely to take another look at APB during the long, uncertain wait for GTA Online on PC?